The Driving Boom—a six decade-long period of steady increases in per-capita driving in the United States—is over. Americans drive he Driving Boom—a six decade-long period of steady increases in per-capita driving in the United States—is over. total miles today than we did eight years ago, and fewer per person than we did at the end of Bill Clinton’s first term. The unique combina­tion of conditions that fueled the Driving Boom—from cheap gas prices to the rapid expansion of the workforce during the Baby Boom generation—no longer exists. Meanwhile, a new generation—the Mil­lennials—is demanding a new American Dream less dependent on driving. Transportation policy in the United States, however, remains stuck in the past. Official forecasts of future vehicle travel continue to assume steady increases in driving, despite the experience of the past decade. Those forecasts are used to justify spending vast sums on new and expanded highways, even as existing roads and bridges are neglected. Elements of a more balanced transportation system—from transit systems to bike lanes—lack crucial investment as powerful interests battle to maintain their piece of a shrinking trans­portation funding pie. Figure ES-1. 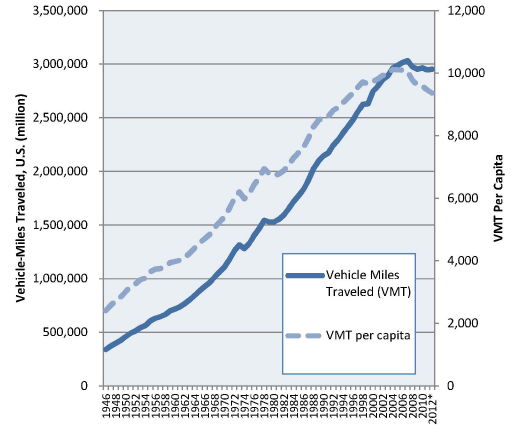 Total and Per-Capita Vehicle-Miles Traveled, U.S.
*2012 data from U.S. Department of Transportation’s (U.S. DOT) Trafc Volume Trends series of reports; data from previous years from U.S. DOT’s Highway Statistics series of reports. The Driving Boom is over. Americans drove more miles nearly every year between the end of World War II and 2004. By the end of this period of rapid increases in per-capita driv­ing—which we call the “Driving Boom”—the average American was driving 85 percent more miles each year than in 1970. Americans drive no more miles in total today than we did in 2004 and no more per person than we did in 1996. On the other hand, Americans took nearly 10 percent more trips via public transportation in 2011 than we did in 2005. The nation also saw increases in commuting by bike and on foot. A return to the steady growth in per-capita driving that characterized the Driving Boom years is unlikely given the aging of the Baby Boom generation, the projected continuation of high gas prices, anticipated reductions in the percentage of Americans in the labor force, and the peaking of demand for vehicles and driver’s licenses and the amount of time Americans are willing to spend in travel. The Millennial generation has led the recent change in transportation trends—driving significantly less than previous generations of young Ameri­cans. Millennials are already the larg­est generation in the United States and their choices will play a crucial role in determining future transportation infrastructure needs. The Millennials (people born between 1983 and 2000) are now the largest generation in the United States. By 2030, Millennials will be far and away the largest group in the peak driving age 35-to-54 year old demographic, and will continue as such through 2040. Young people aged 16 to 34 drove 23 percent fewer miles on average in 2009 than they did in 2001—a greater decline in driving than any other age group. The severe economic recession was likely responsible for some of the decline, but not all. Millennials are more likely to want to live in urban and walkable neigh­borhoods and are more open to non-driving forms of transportation than older Americans. They are also the first generation to fully embrace mobile Internet-connected technolo­gies, which are rapidly spawning new transportation options and shifting the way young Americans relate to one another, creating new avenues for living connected, vibrant lives that are less reliant on driving. If the Millennial-led decline in per-capita driving continues for another dozen years, even at half the annual rate of the 2001-2009 period total vehicle travel in the United States could remain well below its 2007 peak through at least 2040—despite a 21 percent increase in population. If Millennials retain their current pro­pensity to drive less as they age and future generations follow (Enduring Shift), driving could increase by only 7 percent by 2040. If, unexpectedly, Millennials were to revert to the driv­ing patterns of previous generations (Back to the Future), total driving could grow by as much as 24 percent by 2040. 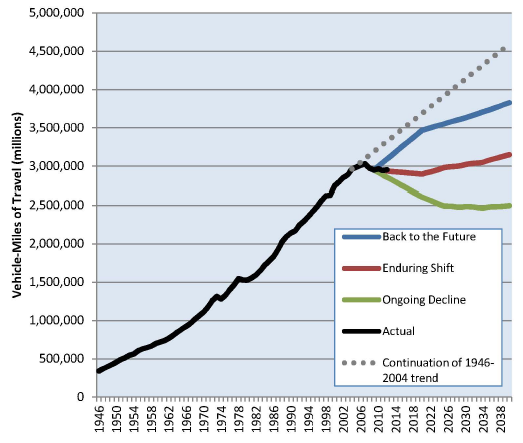 All three of these scenarios yield far less driving than if the Driving Boom had continued past 2004. Driving declines more dramatic than any of these scenarios would result if future per-capita driving were to fall at a rate near that of recent years or if an­nual per-capita reductions continue through 2040. Regardless of which scenario proves true, the amount of driving in the United States in 2040 is likely to be lower than is assumed in recent government forecasts. This raises the question of whether changing trends in driving are being adequately fac­tored into public policy. The recent reduction in driving has already delivered important benefits for the nation, while raising new challenges. Future driving trends will have major implications for transportation policy and other aspects of American life. Traffic congestion has fallen. According to data from the Texas Transportation Institute, Americans spent 421 million fewer hours stuck in traffic in 2011 than they did in 2005. Further reductions in driving could lead to additional easing of congestion without massive investments in new highway capacity, as long as roads are maintained in a state of good repair. America is less dependent on oil. 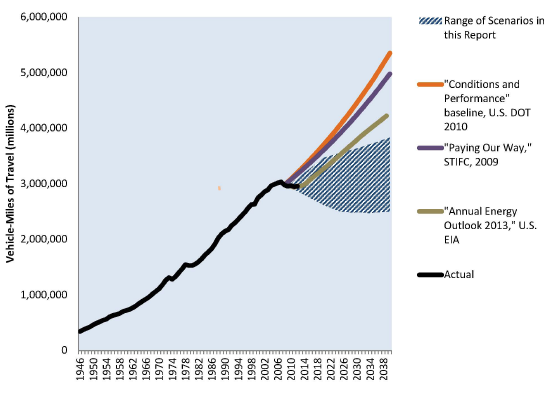 In 2011, gasoline consumption for trans­portation hit a 10-year low. Further reductions in driving consistent with the Ongoing Decline scenario—coupled with expected vehicle fuel economy improvements—could result in the nation using half as much gasoline or other fuels in our cars and trucks by 2040 as we use today. Our roads are getting less use … but the gas tax is bringing in less income. Reduced vehicle travel (par­ticularly in large trucks) reduces the wear and tear on our nation’s roads, reducing maintenance needs. Reduced driving, however, also reduces the amount of revenue brought in by the already-strained gasoline tax. The recent reduction in driving and embrace of less auto-dependent ways of living by Millennials and others creates a golden opportunity for America to adopt transportation policies that use resources more efficiently, preserve our existing infrastructure, and provide support for Americans seeking alterna­tives to car travel. Plan for uncertainty. With future driving patterns uncertain, federal, state and local transportation officials should evaluate the costs and benefits of all transportation projects based on several scenarios of future demand for driving. Decision-makers should also prioritize those projects that are most likely to deliver benefits under a range of future circumstances. Support the Millennials and other Americans in their desire to drive less. Federal, state and local poli­cies should help create the conditions under which Americans can fulfill their desire to drive less. Increasing investments in public transportation, bicycling and pedestrian infrastruc­ture and intercity rail—especially when coupled with regulatory changes to enable the development of walk­able neighborhoods—can help provide more Americans with a broader range of transportation options. Revisit plans for new or expanded highways. Many highway projects currently awaiting funding were initially conceived of decades ago and proposed based on traffic projec­tions made before the recent decline in driving. Local, state and federal governments should revisit the need for these “legacy projects” and ensure that proposals for new or expanded highways are still a priority in light of recent travel trends. Refocus the federal role. The federal government should adopt a more strategic role in transportation policy, focusing resources on key priorities (such as repair and maintenance of existing infrastructure and the expan­sion of transportation options) and evaluating projects competitively on the basis of their benefits to society. Use transportation revenue where it makes the most sense. Trans­portation spending decisions should be based on overall priorities and a rigorous evaluation of project costs and benefits—not on the source of the revenue. Do your homework. Federal and state governments should invest in research to evaluate the accuracy and useful­ness of transportation models and better understand changing trans­portation trends in the post-Driving Boom era.